This is the C.E.M.E. pressure stat, as installed on a Quick Mill Andreja Premium, purchased October 2006. The C.E.M.E Pressure Stat is the black cylindrical component (inside the red circle). Its function is to switch the boiler heating element and maintain boiler pressure, via the temperature, between 1.1 and 1.5 bar. It is understood (but not offically confirmed) that Quick Mill have now stopped installing C.E.M.E pressure stats in place of the MA-TER XP110 pressure stat therefore the supplier, Bella Barista, dispatched a replacement MA-TER pressure stat. Please note that the MATER XP110 pressure stats have a 1/8 inch thread (smaller thread!) the 1/4 inch threads used on the MATER XP110 stats used on Izzo machines. They pressurestats have the same model number, but different threads! Before removing the original pressure stat the cables were labelled: NO, NC & COM. The C.E.M.E stat, on the left, has had the thread adaptor removed. Extensive use of thread lock meant that force was required to break the seal. PTFE tape was used in lieu of thread lock when installing the new components. Note the different orientation of the terminals on the XP110, on the right. The XP110 pressure stat has a larger outer diameter, around the metal collar, than the C.E.M.E. 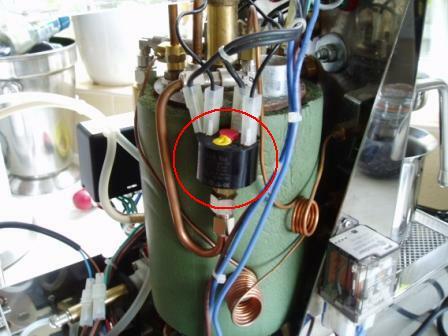 Therefore, the copper pipe had to be gently bent out and away from the boiler wall using a screw driver the same size as the inner diameter of the copper pipe as leverage in the direction of the red arrow. The cables to the terminals have to be re-routed, but the installation is fundamentally very simple: the cable labelled NO goes to the Normally Open terminal; the cable labelled NC goes to the Normally Closed terminal and the cable labelled COM goes to the Common terminal! If required the limits of the pressure stat can be adjusted by rotating the screw, on top of the component, at the end of the red arrow. Clockwise to increase the switch off threshold and counter clockwise to reduce.